Poached pears are a failsafe dessert. They’re quick, they’re easy, and they’re bound to satisfy every time. You can dress them up or down, your guests will devour them regardless. To celebrate these reliable little beauties, I’ve put together four variations on the classic poached pear. The first of these is a Lavender and fruit tea. The tea that I used is from my local fruit shop, and I’m not sure how widely available it is – this is what it looks like, if you’re interested. 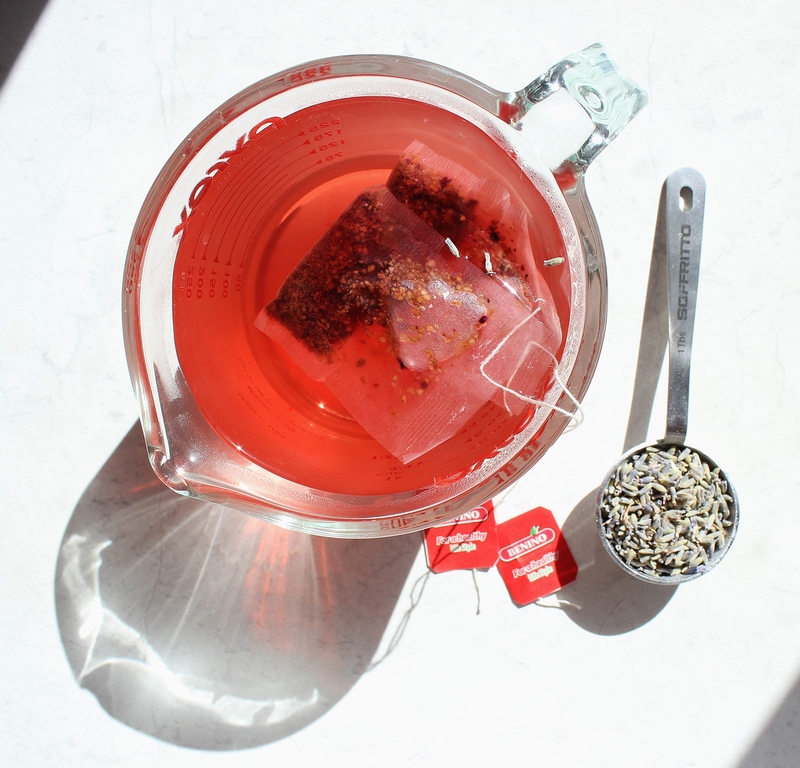 It’s got cranberry, apple, rosehip and hibiscus in it, but anything fruity and sweet enough will match the lavender perfectly. This recipe is beautifully fragrant, it will fill your house with a fruity, flowery smell and you will want to gobble the pears up as soon as they’re off the boil. I don’t advise this though, because they hold their heat very well! Serve whilst warm, with creamy vanilla icing and plenty of syrup spooned over the top. Brew your tea in 2 cups of boiling water. Add the sugar and lavender and allow to infuse for 5-10 minutes. Transfer mixture to a small saucepan (making sure you get all of the lavender buds and sugar transferred as well) and bring the mixture to a boil. Peel your pears in the mean time. Once the mixture comes to a boil, reduce to a simmer and place the pears in. Simmer the pears for 10-12 minutes, until tender. Remove the pears from the mixture and allow them to cool briefly before serving. 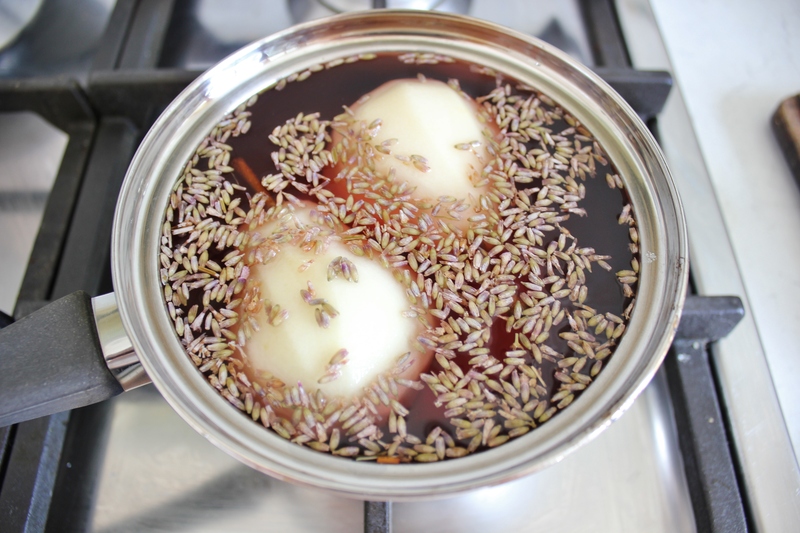 If you want to turn the left over mixture into a syrup, return it to the heat and boil it to reduce and thicken the mixture slightly. I have always wanted to know how to poach pears. This post is a perfect demonstration and the photos are stunning, thank you! Wow Gab! I can imagine how good had to be the smell of those pears! 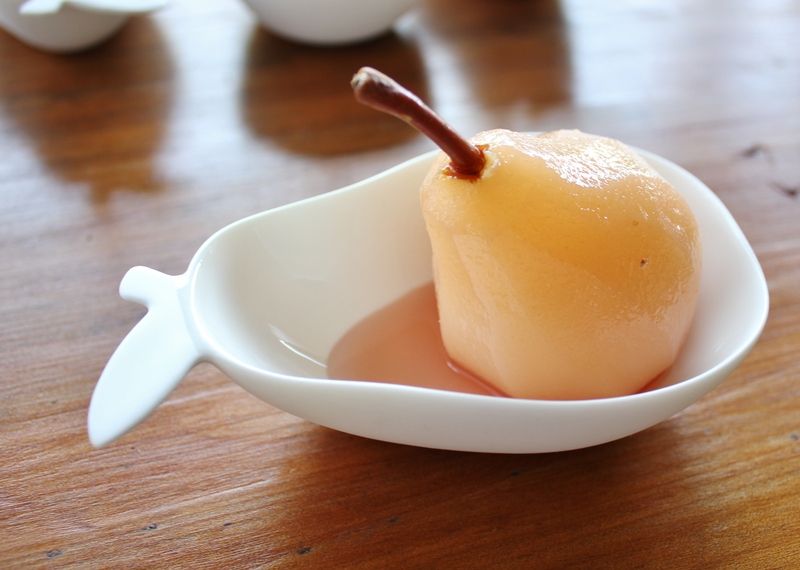 The pears are lovely, poached pears are delicious and your poaching liquid/syrup is wonderful. I love the simple but elegant presentation of the pear and the photo is awesome. I wish I could just grab the pear and eat it. Thanks for sharing. You make me want to poach a pear!!! This looks and sounds lovely! I still have a small bag of lavender, and it’s pear season. The poached pears would probably be great in a quick tart as well? I love poached pears brings back memories of my childhood when Grandma used to make them now I can learn how it is done thank you! That’s so lovely, thanks for sharing Krystal 🙂 Let me know how they turn out! !